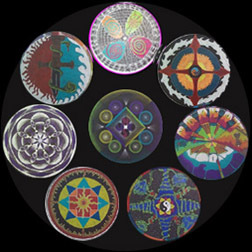 "Sacred Circles" was a two-week, 4-hour per day minimester course during the 2000-2001 school year. During the course, 9th through 12th grade students explored the significance and symbolism of circular artwork found in various cultures and world religions. In addition to the academic aspects (which included reading assignments accompanied by questions, as well as a required research paper and presentation), it was also an intensive art production course. Students worked through various skill-building exercises, ultimately creating their own personally-significant circular artwork. They also worked together as a group to create a large, painted mandala. Please click on the covers to view or order these books.